This is Calder White. My son. Grade 9 at SJAM in Waterloo. He loves to write code. Where I *am* still able to exert some marginal influence is in supporting a mashup of hardware skills to go along with the software-fu. There’s a lot of practical utility in being multi-disciplined. And it has never before been easier/cheaper/more fun to explore this space. 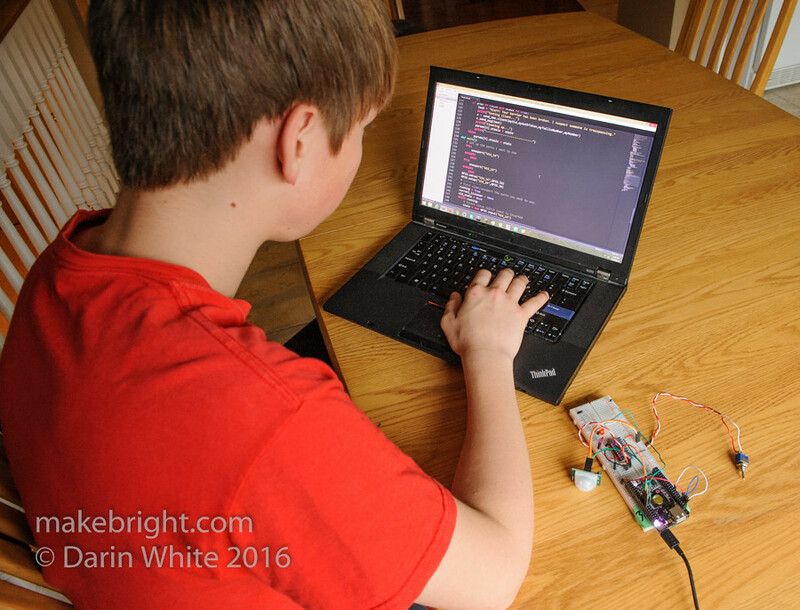 The TL;DR: there are ever-increasing opportunities for your kids (and you) to make stuff out of bytes and solder. Schools, libraries, makerspaces and museums have all sorts of meetups in this domain. You just need to dig a bit to find them. 1. 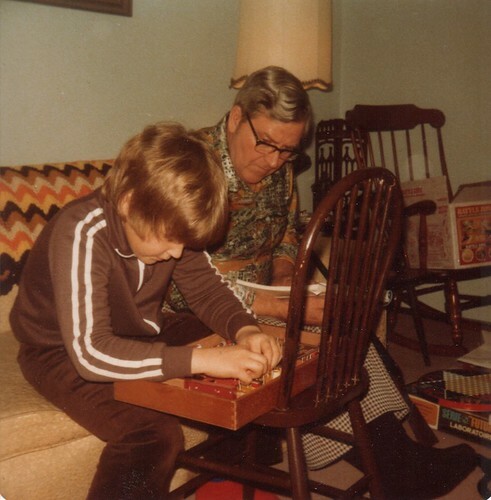 Nobody in my small world could fully explain how these circuits worked. 2. The parts to make (and *not* dismantle) these circuits were too expensive. Fast forward several decades and these challenges are mostly solved, though the solutions are perhaps not uniformly distributed. 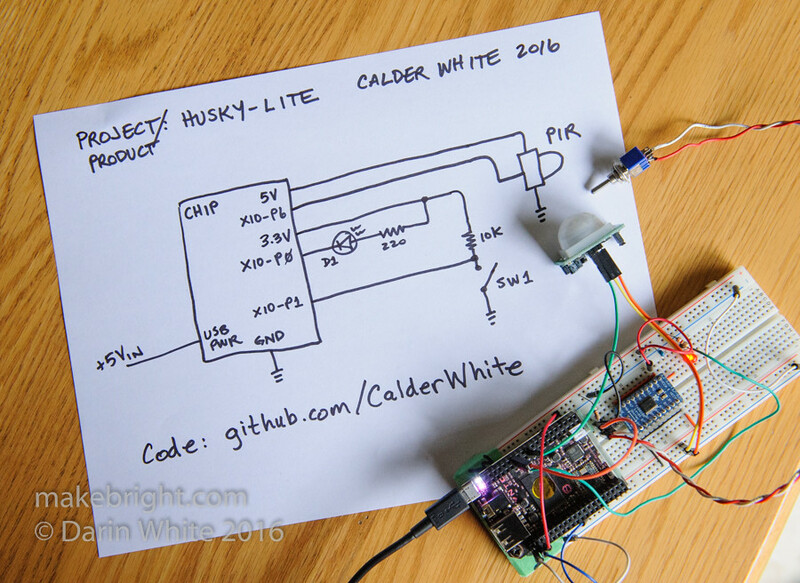 Here’s Calder’s project, dubbed Husky Lite. Basically, it detects a person and then sends a text message to Calder’s phone. Anywhere. The passive infrared sensor (left) looks for changes in heat, and specifically the infrared radiant heat of people. It’s hooked up to a wifi-enabled single board computer called C.H.I.P. (right) that runs a flavour of Linux and also the Python scripts that Calder wrote. 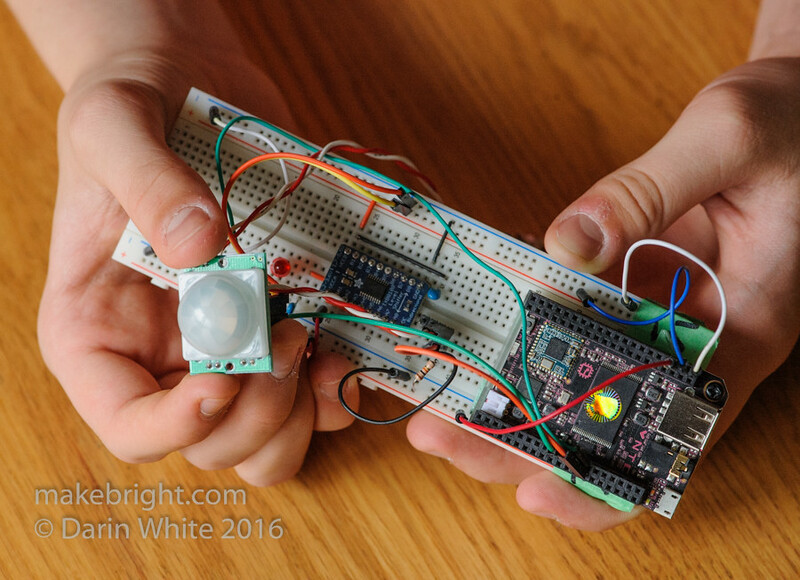 The CHIP watches for changes on the sensor and then calls a Twilio API over the net to trigger a text message to the phone. All this for less than $20 in parts and facilitated by a lot of free open source software and internet knowledge sharing. I just needed to explain a few things about logic voltage levels, pull-up resistors and switch debouncing and Calder took it from there. He hasn’t publicly posted the code for Husky Lite, but some of his other projects are on github. That in itself sort of blows my hair back, considering I was 22 before I saw a code repository (CMVC when I worked at IBM). 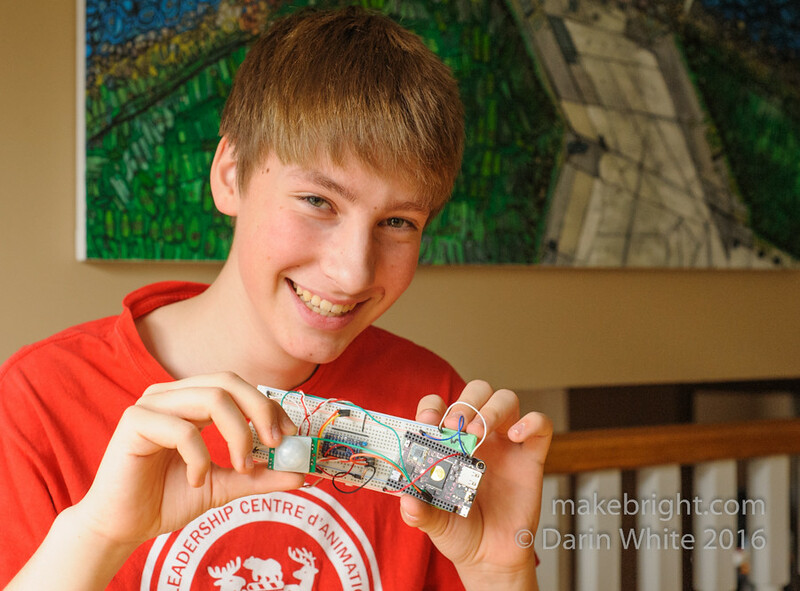 He uses Skype to meet with other teen devs to work on projects for fun. He joined the computer science club at school and is quick to learn and to help teach others. Obviously I’m a proud dad. The broader observation here is that while it’s very popular to fret about the negative impact of tech on teens, they have an enviable opportunity and toolset with which to create a positive future. This entry was posted in making and tagged hack, hardware, software. Bookmark the permalink.